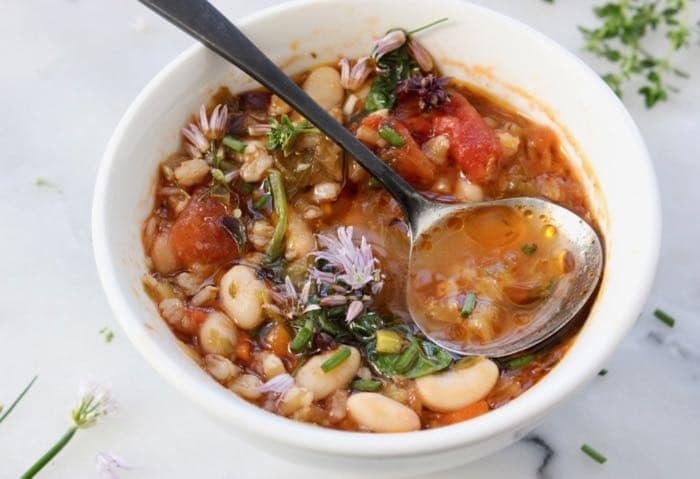 The very best minestrone soup recipe ever. Vegan, quick and easy to make from scratch, on the stovetop, hearty, healthy and 100% plant based. Made without pasta but loaded with clean plant protein from white creamy cannellini beans, spinach, leeks, zucchini and nutty good for you whole ancient grain farro. Homemade soup has to be the most comforting food on the Planet. 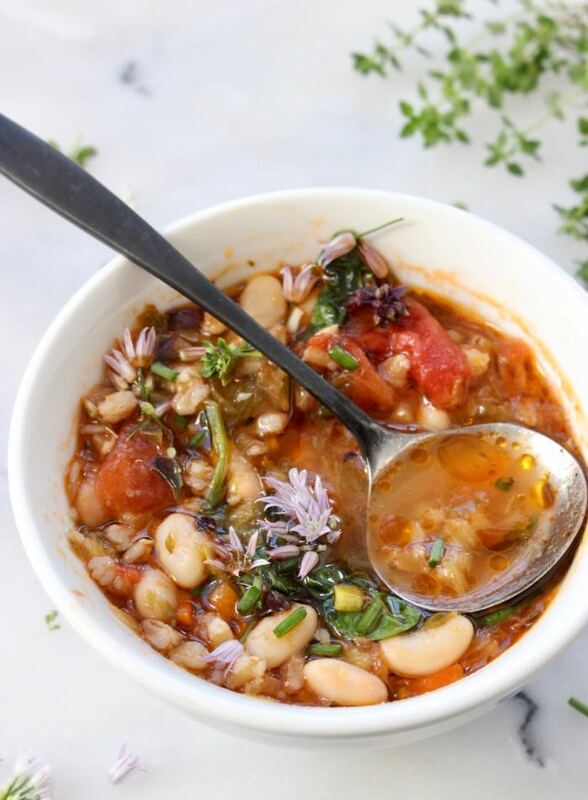 Throw a bunch of vegetables, grains and legumes into a pot, add your favorite herbs and spices ( oregano, sage, thyme, rosemary, basil), simmer away and before you know it you have tasty magic in a bowl. Simple! Sign me up for leftovers please! 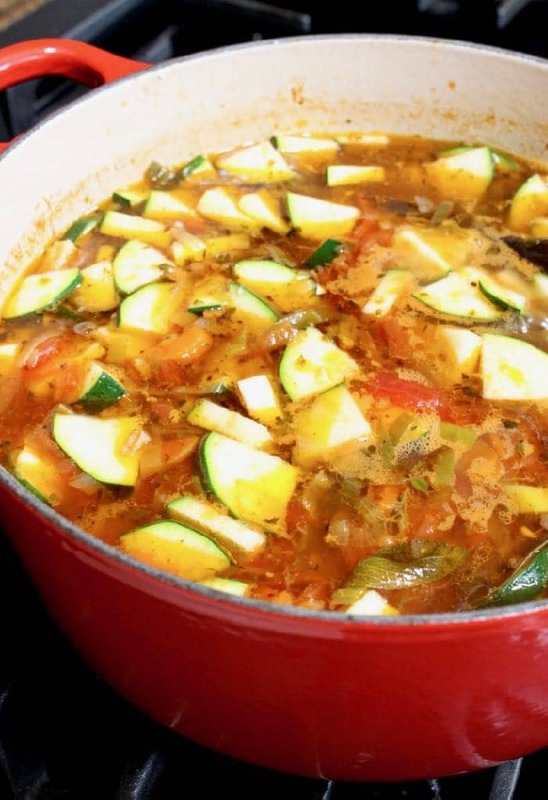 Minestrone is an Authentic Tuscan Italian Vegetable Soup! 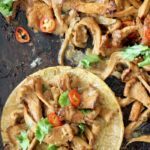 Usually made with whatever produce is in season and thickened up with grains, pasta or potatoes, it makes fantastic leftovers and keeps well in the fridge for up to a week. If you choose to use pasta instead of farro, just make sure to go for a whole wheat or gluten free variety. Traditionally short shapes like penne, elbow macaroni, ditalini, orzo and even gnocchi are used. Personally I’m really fond of farro also known as the “ mother of all wheat ” in my pot of minestrone soup. The recipe is always changing depending on the season and what’s in my plant-based pantry and refrigerator at that moment in time. Swap the spinach for kale or chard and the zucchini for shredded cabbage or even mushrooms. Be creative, don’t be afraid to experiment. Lately I’ve been having a blast with dandelion, radish greens and lots of fresh herbs. Ideally you’ll have some homemade vegetable stock in the fridge, but If you don’t you can use an organic low-sodium store bough variety. There’s nothing like a steaming hot bowl of soup and a sandwich on a cold winter day. As always, If you make this recipe please remember to come back here to rate it, snap a photo and tag us with #VeggieSociety on Instagram. the very best minestrone soup recipe ever. 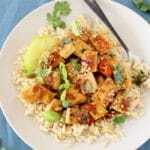 Quick and easy to make on the stovetop, hearty, healthy, plant based and of course vegan. Rinse and slice the leek in half lengthwise. Slice it across into small pieces and rinse them well in a colander. Alternatively you can add them to a bowl with cold water and all the sand and grit will fall to the bottom. Gently scoop them out and dry well on a tea towel. Heat up a medium soup pot on low flame. Add splash of veggies stock (or a lug of olive oil) and the sliced leeks with a pinch of sea salt. Give it a good stir and sauté for 5 minutes until they start to wilt. Stir in the carrots and cook an additional 5 minutes then add the farro. Toss to coat and toast for a few minutes. Add the dry oregano, bay leaf, thyme, sage and fresh oregano sprigs. Pour in the vegetable stock, give everything a good stir and bring to a simmer. Add the nutritional yeast and cook 15 minutes. Add the crushed tomatoes to the pot together with the zucchini. Simmer another 15 minutes or until the farro is cooked through but still a little al dente. 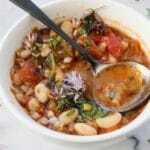 Rinse the cannellini beans if using a canned variety and add them to the minestrone soup. Cook another minute or so until the beans are warmed through. Remove from heat and taste. Adjust seasonings with more sea salt then add the fresh spinach or kale. Give it a stir so the spinach will wilt from the steam. If using kale I would cook it an extra couple of minutes as it needs a little extra time to soften. Ladle the soup into bowls and serve garnished with the fresh chives and whatever edible flowers you have on hand. Such a delicicious Soup, will definitely make again now that I have Farro and we just love it. Thinking of other recipes to use it in too, a new favorite. Thank you for the recipe! Such a perfect soup, the flavors are fantastic and I didn’t even miss the Parmesan cheese I used to add before. The nutritional yeast replaces it perfectly and the leeks just add so much flavor to the whole meal. Truly one of the best soups I’ve ever made and I’m now a huge fan of farro. 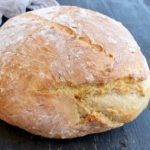 Thank you for sharing this recipe with us!